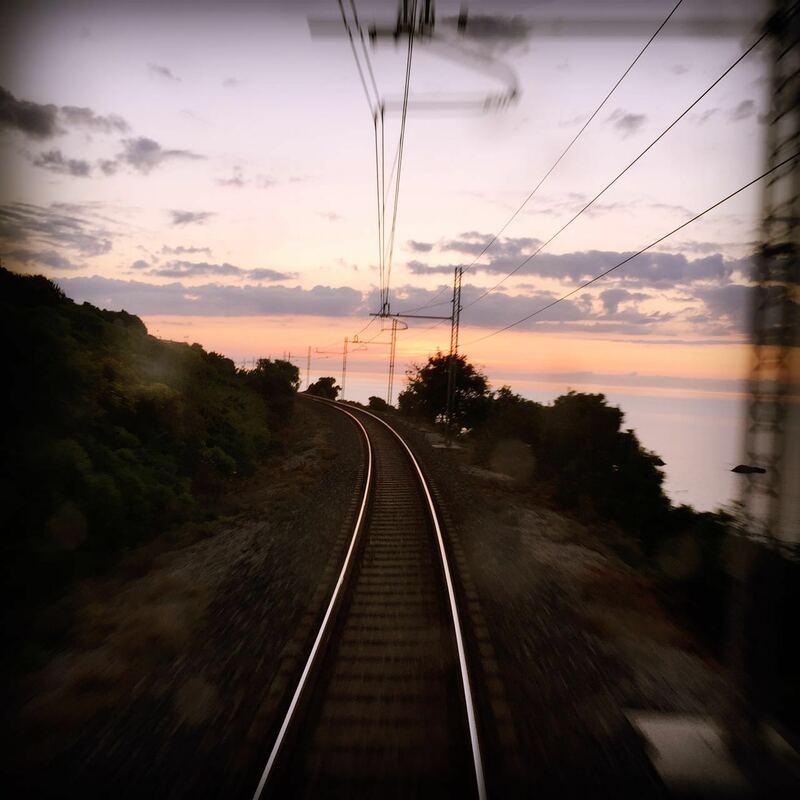 (June 2016) It was primarily a budgetary issue that caused us to take the night train from Palermo to Rome. The airfare was too expensive for our group, especially with all of our luggage. 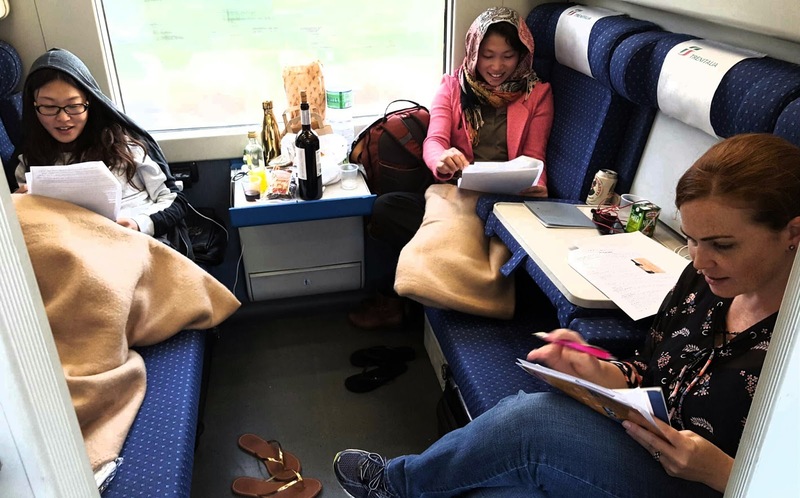 Besides sleeping on the train would also save on one night’s lodging, and it would be an adventure. We had no idea what a great adventure it would be, or how much fun. Many people said it was one of the more memorable events of the trip. So we took the bus from Cefalu to the Palermo train station, about a 40 minute drive. As we passed through Palermo, we were a little disappointed, because we had heard great things about the city, but all we saw were dirty buildings, graffiti and crowds. I’m sure there must be some nice sections, but we did not see them. Our 6:30pm train was delayed for nearly an hour, but eventually we climbed aboard and settled into the two last train cars. Most people had booked cabins that had sleeping bunks for 3 to 4 people, but several of us, including Janeen and I, had a cabin with only 2 bunks. When the beds were in the wall, there was room for 6 to 8 people to sit in each cabin. Sheets, pillows, and blankets were provided, and a small table in each cabin. There was one tiny airplane style bathroom for each train car, and surprisingly no food or drinks for purchase. However, we had been warned to bring our own food, and soon there were multiple parties occurring within different cabins, as everyone brought out pizza, wine, fruit, sandwiches, candies, and many other items to share. We ended up party-hopping between cabins and had a great time. A few other people in our train car who we didn’t know joined us, and we ended up sharing many bottles of wine. But, despite being warned multiple times by Lorenzo, our guide, that we should never leave our cabin or items unattended, one person left their iPhone on his bed and thieves slipped in and stole it. The police were called, the train was stopped, and the thieves caught and questioned, but the iPhone was not retrieved. After all of the excitement, people started pulling their beds from the walls and going to sleep. I fell asleep around midnight and woke at 6:30am. The rocking of the train helped me sleep, though other people complained it was difficult. In fact I slept so well that I missed the train being placed upon the ferry to cross the Straits of Messina. During this time you can get off the train and go upstairs to watch the sea from the ferry crossing. Despite all of the delays, the train actually arrived in Rome only 10 minutes late, so many of us were scrambling to get ready and jump off the train with all of our luggage at 7:15am. Since our hotel, the Gioberti, was less than a block from the train station, we all dragged our luggage there to drop it off and then go search for coffee. Amazingly about half of our rooms were ready, so I was able to check in and take a shower. At 11:20 we met our Rome guide, Giuseppe, in the lobby and he led us to the subway and then to the Vatican for a tour of the Sistine Chapel, St. Peter’s Basilica and the Square. It was raining lightly, but that didn’t stop the crowds. You had to push through masses of people, but the La Pieta, Michelangelo’s statue of Jesus and Mary, was just as mesmerizing as the last time I had seen at in the 1980’s – even though it was under glass now. After a quick pizza lunch in the square, we caught the subway to the Colosseum, and toured that from 4 to 6pm. The sun came out and the light on the ancient walls of the stadium, as well as the Palatino & Roman Forum was beautiful. Later we had dinner at the rooftop restaurant of Mecenate Palace Hotel and watched the sun set behind the Basilica of Santa Maria Maggiore. It was a beautiful magical last evening in Rome. The alarm went off far too early, around 3:30am, and we left the hotel at 4:30am to arrive at the airport at 5am to catch our 7am flight to Istanbul. After a short layover, we connected to a nonstop flight back home to San Francisco, where amazingly enough, no one sat on either side of me, so I was able to stretch out on 3 economy seats and sleep most of the 10 hour flight. We arrived back home just in time for rush hour traffic, and watched in horror a week later when the Istanbul airport was bombed. Our prayers to Turkey, another country with an amazing wine history, that I hope to visit some day when it is at peace. (June 2016) The previous evening in Messina, we had enjoyed a group celebration dinner at La Tonnaro Restaurant. Known for its fresh seafood, we were happy with the large platters of mussels and calamari we started with, along with a local sparkling wine made from the inzolia grape. The next course was a seafood risotto, followed by a main course of stuffed swordfish. We ordered a variety of wines including several made of the grillo grape, which many people had fallen in love with, along with two different bottles of nero d’avola. We were grateful for the celebration dinner, because the next day was our last day on Sicily, before taking the night train from Palermo to Rome. To insure we enjoyed our final day, several people suggested we stop at Cefalu for lunch, located halfway between Messina and Palermo. Pronounced “Chefalu”, Cefalu is a charming seaside village famous for its white sandy beach. When we arrived the gray clouds that had been following us all morning had just starting to thin, but it was still breezy with a hint of rain. Therefore, everyone split up to wander the narrow streets of the charming old town, looking for a place to eat lunch. We ended up at one of the many small cafés that line the beach, and felt fortunate to get a table overlooking the water. I ordered calamari and we shared a bottle of grillo – our new favorite Sicilian white wine that is slightly reminiscent of pinot grigio and perfect for the beach and seafood. After splitting a cannoli for dessert, we wandered down to the beach. The sun came out and soon it was quite hot. After wading in the water for a while, I settled down on the sand and took a short nap. When I woke up, it was almost time to meet everyone at the bus, so I wandered back through the narrow streets of the town and found the Duomo di Cefalù. After climbing the steps and visiting the famous cathedral, I found a small café to purchase food and water for the train, and then headed back to the bus. (June 2016) That morning we checked out of our hotel in Messina around 8am and drove about an hour and a half along the northern coast of Sicily towards Palermo. Our destination was Abbazia Santa Anastasia, which is a winery housed in a 12th century Abbey where the Benedictine monks were making wine more than 900 years ago. In the 1970’s the old abbey was purchased by the current owner and converted into a winery with a hotel and restaurant. Perched on a hilltop only 7 miles from the ocean, the abbey has amazing views of the water and over 65 hectares of organic and biodynamic vineyards and 50 hectares of olive orchards. When I return to Sicily, I definitely want to stay here for a couple of nights. We were greeted by four very passionate people – the viticulturist/winemaker, the tourism director, marketing director, and export manager. It was one of the most welcoming experiences we had because they invited us to sit down for espresso and biscotti and then asked us what questions we had. Therefore instead of being lectured to immediately, we had an open conversation and they had a clearer idea of what we were interested in. We spent some time talking about marketing and wine tourism, and were impressed with the amount of social media and Internet marketing they were doing, including Facebook, Twitter, TripAdvisor and Booking.com. They also focused on gastronomic tourism by offering cooking classes, special dinners, and other events to bring people to the estate. After about 30 minutes of coffee and Q&A, we took a tour of the cellars and were impressed with the glass lined concrete tanks used for the biodynamic wines to control temperatures more naturally. The non-biodynamic wines were made in either stainless steel tanks or foudre (large oak barrels). After touring the fermentation room, we moved to the barrel storage room and saw they were using a combination of 225 liter and 500 liter for aging. After the tour we were escorted through the hotel and restaurant, and were very impressed with the beautiful old furniture and décor. The courtyard of the abbey is especially charming with red roses climbing up the ancient stone walls. The restaurant has a terrace that looks out over the ocean, and there is a large swimming pool below. We settled into a lovely old room that was set up with roundtables for our wine tasting. Here we were treated to four delicious wines, two made organically and two biodynamically. 2013 Passomaggio Abbazia Santa Anastasia (biodynamic)– a blend of 55% Nero d’Avola, 30% Merlot and 15% Cabernet Sauvignon. Fermentation in large oak foudre, then 15 to 18 months of aging in 500- liter French oak barrels. Huge, spicy, black fruit and earth, pepper, velvety tannins, and long finish. An amazing value at only 9.60 euros! in Sicily. 2012 Sensinverso Nero d”Avola (biodynamic) – 100% Nero d’Avola with a beautiful perfumed nose of mixed berry and spice. Aged 30 months in small oak barrels and then another year in bottle, this wine was lovely with soft velvety tannins, generous but well integrated oak and warm berry compote. A long gentle finish. 17 euros. Before we left, we stopped by the wine shop to purchase some wines, and were delighted to find again that they sold wine by the “wine gas pump” so that customers could refill their own containers. The hospitality at Abbazia Santa Anastasia was warm and genuine, with everyone falling over themselves to welcome us and make sure we were comfortable and all of our questions were answered. They even walked us to our bus and stood in the driving waving good-bye until we could no longer see them. I definitely want to come back here and stay a few days at the hotel. (June 2016) Benanti is one of the oldest and most prestigious wineries in Sicily, and as such, only allows tastings by appointment in their family mansion located in the small town of Viagrande. There is no sign announcing the winery, and the estate is surrounded by a tall wall and high iron gates. Driving along the hilly residential road with glimpses of the blue sea below, it is very easy to miss. Fortunately our bus driver had the GPS coordinates, and Lorenzo, our guide, went inside the property to make sure we were at the correct location. Once this was ascertained, we descended from the bus and walked up a long driveway with a view of the two-story gray stone mansion at the end. A graveled patio, wine barrels with flowers, and large green lawns graced the property, while directly behind were steep slopes covered with vineyards climbing up the flank of Mt. Etna. Originally started in the 1700’s, the vineyards and winery have been passed down through the generations, and are currently managed by Antonio Benanti. With only 14 hectares of vineyards and producing around 150,000 bottles per year, Benanti is a true “cult” winery of Sicily. Indeed the general tasting fee of 50 euros per person was the highest we encountered on our trip to Southern Italy, and reminded me of the price paid in Napa Valley to visit a cult winery. Benanti exports 70% of their production, with the USA as the largest market. They have received high ratings and very positive reviews from US magazines, such as Wine Spectator. Antonio Benanti, with his quick youthful movements, good looks, and obvious passion for his wines, easily charmed our group with his explanation of the vineyard and winemaking processes. He stressed how different the climate and terroir of Mt. Etna were, and described how growing up on the edge of a volcano shaped him, his family, and the wines. “It is funny how an aggressive volcano can create such delicate, balanced and elegant wines,” exclaimed Antonio, as he held a glass of white wine, made with the carricante grape, up to the light. He then explained how his family was responsible for pioneering the rebirth of Mt. Etna, whose great winemaking legacy had fallen into the same bulk wine morass that had tainted all of Sicily until recent times. In 1988 the Benanti family brought in a team of experts to help revamp the vineyards and winemaking processes. In 1993 they introduced their first wine at Vin Italy, and then spent 3 to 4 years traveling around the world to promote the wines. The promotion element was very important we learned, because the style of Benanti wines is quite distinct. Antonio describes the climate as an “Alpine altitude at a Mediterranean latitude.” He says the closest region making similar wine styles is Alto Adige. With a focus on grapes that are specific to the Mt. Etna terroir: carricante, nerello mascalese, and nerello cappuccio, all of their wines are very mineral driven, with high acid, and delicate balanced styles with elegance. They are not the normal heavily textured whites and reds of Southern Italy. Again this is due to the higher elevation on Mt. Etna, the cooler climate, airflow, and the unique volcanic soil. Irrigation is not allowed. Due to Benanti’s leadership, there are now over 131 brands produced on Mt. Etna, because many other small wineries have started up in the past decade. We began our tour with a walk up the hill to the vineyards spread out along a gentle slope on Mt. Etna with views of the ocean. 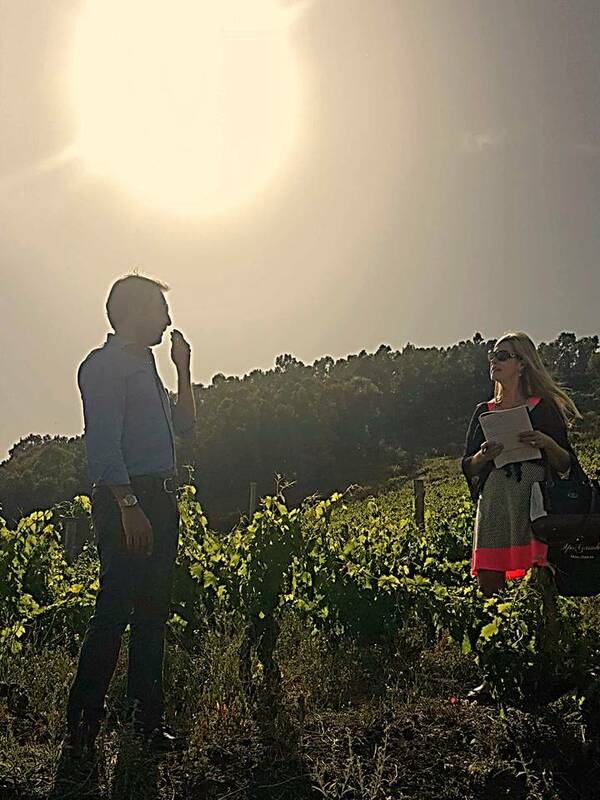 Antonio escorted us to an ancient vineyard with vines aged over 100 years, and described the low yield and the high quality coming from these small antique vines. He pointed to other newer blocks, and described some of the other varieties they were experimenting with, but stressed that their focus was on indigenous varieties. Viticultural techniques are mainly organic, only using organic products such as sulfur, copper and manure for fertilization. They have 20 to 25 seasonal workers. As I stood on the slopes of Mt. Etna surrounded by the ancient vines climbing up the hillside, I couldn’t help but feel the pulsing energy of the mountain. I thought of how the lava must have poured down this slope to the shining blue sea so close by, and knew the roots of the vines were digging deeply into this unique soil. It was truly one of the most beautiful vineyards I have ever seen. After our tour of the vineyard, we walked back down the hill, and Antonio ushered us into a cellar with a huge wooden press that had been built in the 1700’s. Called a “Palmento,” Antonio told us it was an ancient winemaking operation that used to be shared by the whole community - similar to a communal olive oil press. The Palmento is actually attached to the mansion, and Antonio explained that the house had been build up around it. Based on a gravity flow system, workers poured in the grapes on the top floor, where they were crushed by foot, and the juice and must flowed to underground stone tanks for fermentation. Antonio told us the workers would stand in a circle, holding one another by the shoulders and sing a song that required that each person sing a different verse. In this way, if someone didn’t sing their part, they knew that person was exhausted and perhaps overtaken by the fermentation fumes. This is because fermentation would often start during the stomping process. After fermentation, the giant press was used to press the new wine and it was placed back into the stone tanks for aging, or immediately bagged in large oil skins for transport to market. In addition, customers could stop by the palmento and bring their own bottle to purchase wine. Antonio said he witnessed the Palmento being used when he was a child. There is also a Youtube video of the ancient process. See here as well as here. Though the palmento still works, today the Benanti’s make their wine in a modern winemaking facility in the back of the property. However they plan to operate the palmento once a year as part of a festival and to demonstrate how it works. Their winemaking philosophy is to let the varietal characteristics of the grapes shine through the wine. Therefore they only ferment in stainless steel for whites and older French oak for reds. Fermentation temperatures range from 18 – 19 C for whites and 25 – 26 C for reds. Interestingly, they have patented four yeasts, which are unique to their microclimate and came from the palmento. After viewing the Palmento, Antonio invited us into a beautiful large room in the mansion. It was filled with expensive oil paintings, tapestries, red velvet curtains, a large stone fireplace, and crystal chandeliers. In the center of the room there were six tables elaborately set with large wine glasses and plate after plate of delicious Sicilian appetizers. It was the most ornate room we had tasted in on our whole trip, and everyone was in awe over the luxurious surroundings. Antonio invited us to help ourselves to the appetizers, which included plates of local cheeses, meats, olives, breads, and tapenades. While his assistants poured us three Benanti wines, Antonio explained the winemaking techniques and characteristics of each. All three were very distinctive, well-made and exquisite to taste. 2013 Benanti Etna Bianco - made of 100% Carricante grape, stainless steel fermented, then aged for 18 months before release. Crisp, fresh and mineral driven with lemon, nuts and a salty note. Unique, refreshing and enjoyable to drink. 2012 Benanti Nerello Cappuccio – made of the blending grape called Nerello Cappuccio, which means “black pouch or hood,” because the grape vine looks like a hood when it grows on the bush vine (albero trained vined). Everyone fell in love with this grape because it had soft velvety tannins and a ripe cherry and berry palate with a floral note. Similar to a soft pinot noir with medium ruby color, Antonio told us it was often the favorite wine of women, due to the approachable tannin structure. 2012 Benanti Nerello Mascalese – blended with 20% Nerello Cappuccio to add color and softness, this wine nevertheless showed the massive tannins of Nerello Mascalese, which combined with its lighter red color and earthy, tar notes, reminds me of a toned down nebbiolo. It was also aged in 30% new French oak with medium toast. The wine had crisp acid and paired well with the cheeses and meats. As we tasted, Antonio stressed that all three wines were age worthy, and could last in bottle for years – even the whites. In addition, he ages the carricante and nerello cappuccio in tank with nitrogen protection for 18 to 24 months before bottling. We were surprised to hear this, because keeping that many vintages in tank would take up a lot of room in the cellar and be costly. Most people would age in bottle so to have room for the new harvest, but he explained that he felt he had more quality control by monitoring tanks. After bottling, the wines continue to age in bottle for another 3 to 12 months, depending on the vintage and varietal. The nerello mascalese is aged in 30% new French oak. Our visit to Benanti was very memorable, not only due to the luxurious beauty of the tasting and the wonderful tour of the vineyard and palmento, but especially because of Antonio’s passion and enthusiasm for his wines and the volcano he calls home. (June 2016) The next morning we left the hotel around 9:30 to drive to our 11am appointment with Planeta Winery at their Feudo di Mezzo location on Mt. Etna. Planeta actually has six different wineries across the island, all with unique names, but they all fall under the family brand name of Planeta. The drive from Messina to Mt Etna was beautiful, with colorful red and pink flowers along the highway and the blue sea twinkling at us. When we rounded a corner and saw the huge bulk of Mt. Etna with smoke still swirling around the top from the eruption the previous week, we all caught our breath in awe. It is a huge mountain (10,991 feet in elevation) – similar to the volcano on the island of Hawaii – and seems to take up the whole island. Snow still nestled upon the upper slopes, and it rose dramatically against the blue sky. Then we turned off the highway and began snaking our way up the back portion of the mountain. Along the way we made a rest stop at the Alcantara Gorge, which is a deep canyon formed by the Alcantara River which rushes down from the slopes of Mt. Etna. The canyon is composed of lava which the rushing water has carved into unique ballast pillars and steep gray rock walls. A popular activity for tourists is to go wading in the river wearing large rubber hip boots. It was a great rest stop with plenty for free bathrooms and a tasty espresso bar. Then we spent some time looking over the edge of the canyon and taking photos. After our rest, we climbed back on board the bus and continued to zig zag our way up the back slopes of Mt. Etna. The landscape slowly changed from the lush green vegetation below to black volcanic rock formations and flowering bushes covered in yellow and pink flowers. The turn off to Planeta’s Feudo di Mezzo winery is easy to miss, as it is a small paved road weaving through volcanic rocks and bushes. The landscape was the most unusual I’ve ever witnessed for vineyards. In keeping with their focus on sustainability, the winery building is simple and composed of black volcanic stone so it blends in with the scenery. We were met by four very friendly Planeta employees, the winemaker, director of hospitality, wine tourism director, and export VP. They invited us on a tour of the small cellar made of black volcanic stone, and then invited us to walk down a steep trail to see a hidden ancient vineyard they had found on property. To get to the vineyard, we had to climb down a slope littered with black volcanic rocks and flowering shrubs. We were accompanied by the winery dog, a huge German Shepard, who was very friendly. The secret vineyard was one of the most exciting events of my time on Sicily, because it was a pre-phylloxera vineyard with vines of 120 years old. They were tiny, shrunken and composed of a field blend of indigenous grapes that had still not yet been completely identified. 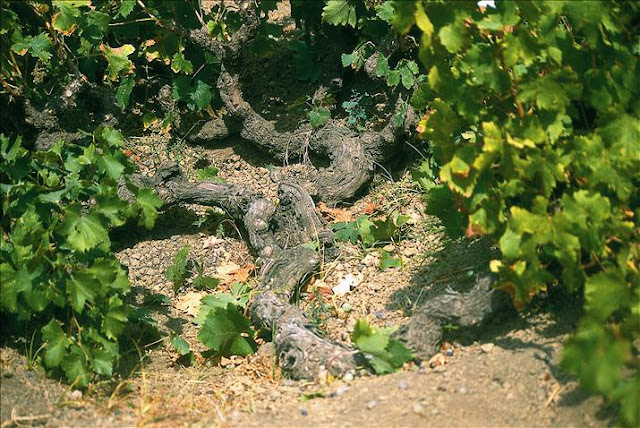 There were probably only about 200 vines in total, and the reason it is thought they survived is because the vineyard was located in a protected bowl, which looked like a small crater. It was exciting to be there amongst the ancient vines, and we took lots of photos. Interestingly the vineyard was surrounded by lush green ferns. Afterwards we returned to our bus and drove a short distance up the mountain to the main visitor center of the winery. This was surrounded completely by vineyards and an incredible view of the valley below. We were invited into a long room, which was set up for a private tasting and presentation. It was here that we learned about the unique grape varietals of Mt. Etna, not found on other parts of Sicily. Due to its high elevation, the climate on the slopes of Mt. Etna is cooler, so the wines produced are lighter and more elegant with naturally high acid -- very different from the heavily textured whites and reds we had elsewhere in Southern Italy. Started in 1995, Planeta produces 2 million bottles of wine annually, but only 250,000 at this small winery location on Mt. Etna. They have a total of 90 acres of vineyards, with 26 on the mountain ranging from 500 to 1000 meters (3000 feet high). We enjoyed a tasting of four wines, and it was here that I found a new favorite varietal – Carricante (the Riesling of Sicily). It is used to produce crisp elegant white wines as well as sparkling. Planeta Etna Bianco 2015 – made from 100% Carricante grape in stainless steel with 10% neutral oak. Fresh citrus and mineral nose with a hint of soft floral. Crisp acid and very refreshing – similar to a minerally riesling. I loved this wine! Planeta Chardonnay 2014 – a buttery lemon apple style chardonnay with generous oak, good acid, and a creamy lemon custard finish. It reminded me a bit of Rombauer chardonnay from Napa Valley. This one was from their winery in Menfi. Eruzione 1614 Nerello Mascalese Planeta 2013 – a medium bodied light red wine made from 100% Nerello Mascalese, another of the unique grapes made on Mt. Etna. The nose was a combination of mixed red berries, rose and spice with a soft entry, but then firm tannins, medium acid and a dried cherry finish. Slightly similar to nebbiolo, but a bit lighter. Planeta Santa Cecilia Nero d’Avola 2013– from their winery in Noto, this red wine had a nose of tar and dried cherry, with some volcanic minerality on the palate. The tannins were soft and the wine streamlined with fresh blackberry and spice. Though we didn’t taste Planeta’s DOCG Cerasuolo di Vittoria wine, made of 70% Nero d’Avola and 30% Frappato, I did purchase a bottle in the gift shop for only 14 euros. However, I ended up giving it away as a gift to our bus driver, because he told me it was his favorite wine. Oh well, I’m sure I’ll get a chance to taste it someday. I also bought their rose made from Nero d’Avola and Syrah. We enjoyed it on the train ride back to Rome. After the tasting, Planeta was kind enough to invite all 28 of us to a sit down lunch of pasta and salad, along with local cheeses, olives, and freshly baked bread. Afterwards they served espresso and cookies in the retail shop while we all eagerly lined up to purchase wine. It was a delightful and very memorable visit. The only downside is we were having so much fun that we were one hour late to our next winery visit. (June 2016) Donnafugata has always been one of my favorite Italian wineries – ever since I had tasted their magical wines at VinItaly several years ago. The experience of tasting their famous dessert wine, Ben Ryé Passito di Pantelleria, with its honey, apricot and nutty notes, has long stayed on my palate memory. Even more memorable were the photos they showed me of the zibibbo grapes that went into the wine. Growing on the tiny island of Pantelleria, south of Sicily and closer to the coast of Africa, the vine must be protected in holes dug into the sandy volcanic soil to shield them from the fierce winds that whip across the island. The long shoots of the vine then creep across the land, hugging the soil for protection. The other beautiful aspect of this winery is its name – Donnafugata, which means “fleeing woman,” and is in reference to Queen Maria Carolina, who hid from Napoleon’s troops in the 1800’s in the vineyards near the winery. This story was immortalized in the novel, The Leopard, which describes some of the history of Sicily. The winery was actually started in 1851 by the Rallo family, and is now in its 5th generation of family ownership. In the beginning, they primarily produced Marsala, but have since expanded to western Sicily and the island of Pantelleria. They adopted the name “Donnafugata” in the 1980’s to highlight their new focus on premium and luxury wine production. When we discovered that it would take us 5 hours to drive from Messina to Donnafugata’s closest winery south of Marsala, it nearly broke my heart because I knew we would not have time to visit, and this was one of the major wineries I wanted to see on Sicily. Fortunately, Donnafugata’s marketing and PR team came to the rescue, because they offered to send two wonderful representatives to Messina to provide us with a private tasting at our hotel. Therefore, we were most grateful to meet Baldo Palermo and Simona Governanti who drove 5 hours to conduct a 2 hour tasting, and then drove 5 hours back! Again, we were completely overwhelmed at the generosity and kindness of the wineries of Southern Italy and Sicily. Baldo provided an overview of the company history, vineyards, and locations. Everyone was impressed with the background of Donnafugata, and how in 1983 the Rallo Family became one of the first Sicilian wineries to break away from the old winemaking production techniques and focus on modern winemaking and labeling. 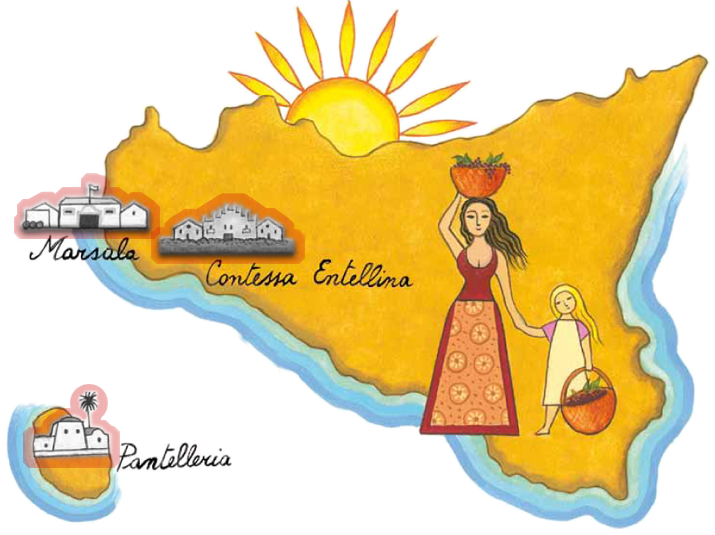 Today they have 338 hectares of vineyards in various locations across Sicily and the island of Pantelleria. With 90 employees, they produce 2 million bottles per year, and sell their wine in 90 countries. Even more impressive, they are certified in both sustainable farming and winemaking, and are a member of the Instituto Grandi Marchi, which is an organization of the 20 most well-known wineries in Italy. We tasted five wines, and all of them were impressive and well made. I was especially pleased with their tech sheets, which were the most detailed I have ever seen, with information down to the number of vines that were used for each wine! 2008 Limited Ben Rye Passito Donnafugata– This is the wine that I had fallen in love with so many years ago, and has always been my benchmark for muscat made in the passito (dried grape) style. With a nose of dried figs and honey, it glides across the palate with exquisite thickness opening into a nutty, apricot and ending with a refreshing acid. With a residual sugar level of 20% (203 g/l), it is dessert in a glass – nothing else is needed. In the US this wine is usually sold for around $38 dollars for a half bottle, but in Italy they sell it in a large bottle for around 50 euros. However, the 2008 is a special vintage that was held back for additional aging, and labeled “Limited”. Therefore this bottle, if you can find it, sells for around $130 in the US. 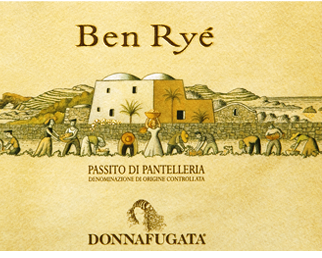 Donnafugata’s Ben Rye is made with the Zibibbo grape, the Italian name for Muscat d’Alessandria. This wine comes from their winery on the island of Pantelleria where the grapes are grown in volcanic soil close to the ground. Due to the high winds on the island, the vines are placed in shallow dips to protect them. Ben Rye is an Arabic term that means “Son of the Wind.” Not only is this an amazing wine to taste, but it has a romantic history and name. Everyone applauded loudly after the tasting, and we helped Baldo clean up the glasses and pack the wines. Then just before he left, he asked if we could take the left over bottles, including some he had not opened. This was very much appreciated by all, and we continued to enjoy Donnafugata wines over the next several days during evening tastings. (June 2016) It took less than 24 hours in Sicily to realize we were in a different country, and it was not Italy. This was a sentiment not only pronounced repeatedly by the Sicilians we met – “We are different. We are not like the rest of Italy. We used to be our own country.” – but also by the landscape, architecture, food and wine. It was different. Even the palpable energy and seemly ready instinct of the people to argue about any topic, made us realize that we were far removed from the quieter and gentler wine regions of the north, such as Tuscany and Piedmont. However the charm and beauty of Sicily was overwhelming, and I was unprepared for the splendor of the island with its towering volcano, flower covered hills, and antique buildings covered with pillars and tiles, all surrounded by a sparkling blue sea and shining white beaches. Sicily is, in a word, breathtaking. At the time of this writing, it is estimated there were around 450 wine producers on Sicily. Many of them produce bulk wine, with reports showing that less than 20% of Sicilian wine is actually bottled. Cooperatives currently dominate Sicily and produce around 75% of the wine. However, the major wine players in Sicily have gained much global recognition for unique and high quality wines. Following is a partial list of these top producers: Donnafugata, Benanti, Planeta, Tasca d’Almerita, Cottanera, Frank Cornelissen, Passopisciaro, COS, Feudo Montoni, De Bartoli, Ceuso, Cusumano, Firriato, Morgante, Rapitala, and Abbazia Santa Anastasia. For one of the best articles I’ve read on Sicilian wines, see Tom Atkin, MW’s blog Cork Talk on Sicily. Interestingly for such a warm climate wine region, the majority of Sicilian grapes are white – at around 65% - with Cataratto being the most widely planted grape variety. This is because Cataratto is the primary grape in Marsala, along with Grillo and Inzolia. Marsala is, of course, the famous fortified wine (20% alcohol) made in Sicily – rather in response to Portugal’s white port. In fact, the Woodhouse firm, also found in Oporto, founded the first marsala firm in 1796. Cataratto – the most widely planted white grape in Sicily, and the main grape in Marsala. On its own, it produces a rather bland, neutral tasting wine with notes of lemon and straw, with medium acidity. However, we enjoyed saying the name of this grape out loud, because we nicknamed it the “Cat and Rat” grape – “Cat- a- rat-to”. Grillo - a white grape with floral and stone fruit qualities and fresh citrus zest. Similar to a light pinot grigio, we found this wine to be a refreshing drink on a hot day. It also pairs well with fish dishes, and is perfect for the beach. Nero d' Avola – the most famous red grape of Sicily, and also the most widely planted. Nero d' Avola is known for its soft tannins, and warm berry and milk chocolate notes. Very approachable and likeable to new red wine drinkers. In order to boost its intensity and add some complexity, however, most Sicilians producers blend it with other grapes, often cabernet sauvignon, syrah and/or merlot. Frappato - another red grape with markers of strawberry, spice, and orange peel. With its medium red color and perfumed notes, it looks and smells like pinot noir, but is usually earthier on the palate. Often blended with Nero d Avola to provide more color and complexity, but very pleasant on its own with light silky tannins. Zibobbo – actually Muscat of Alexandria, but called Zibobbo in Sicily. A white grape used primarily to make the famous passito dessert wines. Very floral with apricot and honeysuckle, most famously grown on the island of Pantelleria. The word “Zibobbo” actually has Arabic roots, and the island of Pantelleria is actually closer to Tunisia in South Africa than it is to Sicily. Carricante – a beautiful white grape that produces elegant, high acid, minerally whites with some floral and citrus notes. The Sicilians call it the riesling of Sicily, and like riesling, it also has the ability to age well. Nerello Mascalese – though a mouthful to pronounce, this red grape produces light colored wines with huge tannins and high acid. With notes of dried cherry, tar and earth, it has some Barolo like similarities. If blended with other red grapes, it can often be darker in color. Like Barolo, it ages well. Currently Sicily only has one DOCG, but after tasting some of the unique white wines from Mt. Etna, I think they should apply to receive another one soon. 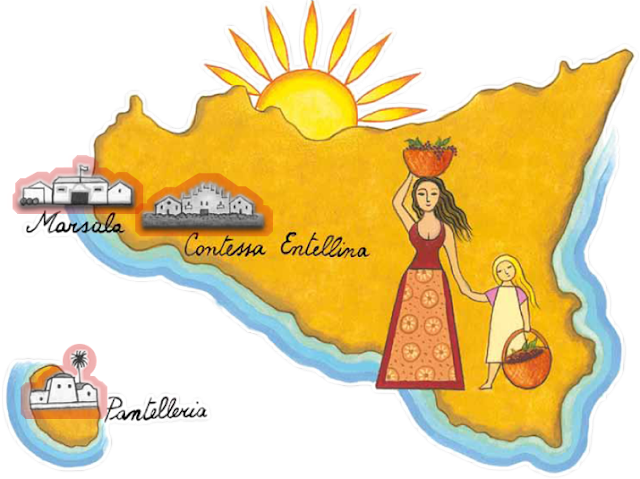 The existing DOCG is Cerasuola di Vittoria is located in the southern part of Sicily and is a special red wine made from Nero d'Avola and Frappato grapes. We tasted several and found them to be delightful, with bright fruit flavors of berries and red cherries, and a hint of Sicilian earthiness.